Procedure: In a bowl dissolve the yeast with a tablespoon of warm water, the seeds of the vanilla pod, 1 tablespoon of sugar and mix well to dissolve the yeast well. In a bowl, pour about 1 / 3 of the flour and add yeast dissolved. Mix with your fingertips, mixing flour and yeast. Transferred the dough on lightly floured work surface and work vigorously with your hands until dough is fairly consistent, which will form a ball.Replace the ball in the bowl with a knife and slit forming a cross, cover and let rise for 2 hours or until it has doubled in volume. After rising time paid into planetary jar of the remaining flour, 3 eggs and 3 egg yolks, mix briefly and add the dough. Work until dough is smooth. 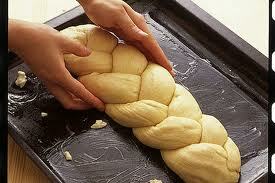 Add the softened butter and continue to work until a soft dough. Transfer the dough on a floured work surface and knead it with a lot of energy without adding flour. When the dough is smooth a ball that is detached from the work surface, cover and let rise in a warm for two hours. After rising time cut the dough into two pieces, in the proportion of 2 / 3 and 1 / 3. Put away the biggest part in buttered mold and the mixture was formed with a ball and place it over the first mixture. let rise again for 1 and 30 minutes. Brush with 1 egg yolk and bake in a preheated oven at 180 C for 55 minutes.